During this tour you will see amazing exhibits of the Historical Museum. Among them are the first Russian gold and silver coins (zlatniki and serebreniki); "Mstislav's Gospel" (a masterpiece of the art of decorating medieval manuscript books), birchbark manuscripts; decorations of boyar’s garments, made in the most sophisticated jewelry techniques; weapons and armor of Russian soldiers; personal belongings of the first Russian Tsar — Ivan the Terrible, relics related to the first Romanovs, one of the largest globes in the world of the XVII–th century, the first Russian printed book and so on. 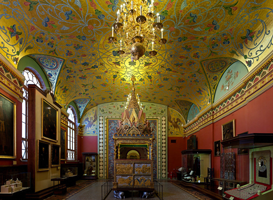 Also you can enjoy the amazing interiors specially designed for the Historical Museum with the participation of famous artists such as Victor Vasnetsov, Henryk Semiradsky, Ivan Aivazovsky. Duration time: guided tour lasts 1 h. 30 m.